Best of the Year: Time Magazine, Salon, Boldtype, PopMatters. Kelly Link's engaging and funny stories riff on haunted convenience stores, husbands and wives, rabbits, zombies, weekly apocalyptic poker parties, witches, and cannons. Includes Hugo, Nebula, and Locus award winners. A Best of the Year pick from TIME, Salon.com, and Book Sense. Illustrated by Shelley Jackson. Link lives in Northampton, Massachusetts, where she and her husband, Gavin J. Grant, run Small Beer Press, co-edit the fantasy half of The Year's Best Fantasy and Horror, and play ping-pong. In 1996 they started the occasional zine Lady Churchill's Rosebud Wristlet. 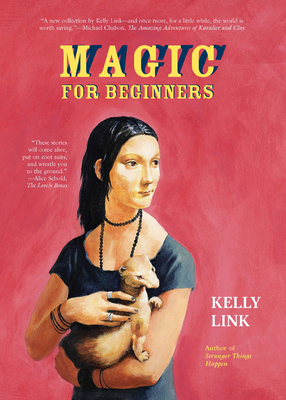 Kelly Link is the author of three collections of short stories, Stranger Things Happen, Magic for Beginners, and Pretty Monsters. Her short stories have won the Nebula, Hugo, Locus, and World Fantasy Awards. She was born in Miami, Florida, and once won a free trip around the world by answering the question "Why do you want to go around the world?" ("Because you can't go through it.") Link and her family live in Northampton, Massachusetts, where she and her husband, Gavin J. Grant, run Small Beer Press, and play ping-pong. In 1996 they started the occasional zine Lady Churchill's Rosebud Wristlet. Locus Award winner. Young Lions Award, Bram Stoker, World Fantasy Finalist, Story Prize recommended reading list.